Experience the sheer joy of viewing and discovering the Flemish Book of Hours of Marie de Medici from the Bodleian Library in Oxford: the perfect beauty of its bright colours, its delicately shimmering gold, and its narrative images and realistic details. Immerse yourself in the imagery of the Flemish Late Middle Ages! In 1515/20 the Flemish Book of Hours of Marie de Medici was decorated in Bruges or Ghent by a book illuminator, who is referred to as the “Master of the David Scenes in the Grimani Breviary”. Counted among the great Flemish masters, he is often mentioned together with Gerard Horenbout and Simon Bening. He is known to have participated in the illumination of the most renowned Flemish illuminated manuscript, the Grimani Breviary, from which he takes his somewhat unwieldy name. From as early as the 1490s the Master of the David Scenes operated a workshop that specialized in devotional books. When he illumined the Flemish Book of Hours of Marie de Medici, he was at the peak of his artistic ability. The lavishly illuminated books of hours made by the Ghent-Bruges School were in great demand throughout Europe, even though printing was already commonplace at the time, and the formerly prolific manuscript production in the leading centres of book illumination was gradually declining. Not so in the Burgundian Netherlands, where a fresh though final flowering of book illumination began, which gained high recognition well beyond its regional borders. The great demand for Flemish manuscript painting was an inspiration for the illuminators who kept competing with one another, forever creating novel features. Characteristic of this development is the type of trompe-l’œil borders where flowers and insects are placed, as if strewn, on a background. 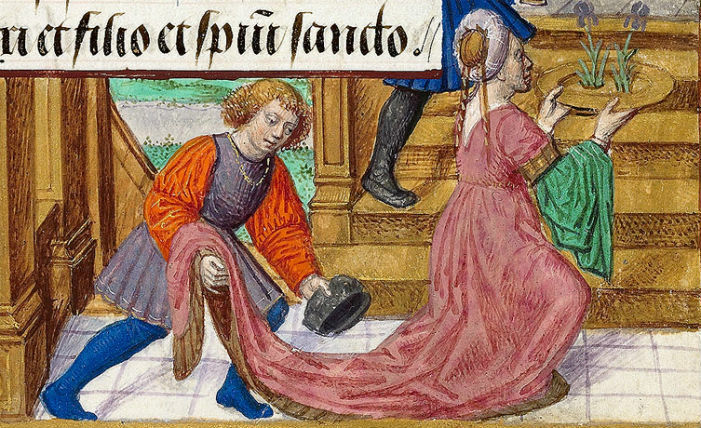 It is not known who commissioned the Flemish Book of Hours of Marie de Medici. For the first one hundred years, its history remains in the dark. The manuscript takes its current name from the widow of Henry IV, King of France, Marie de Medici. Her failed coup against Cardinal Richelieu in 1631 led to her being banished from France. 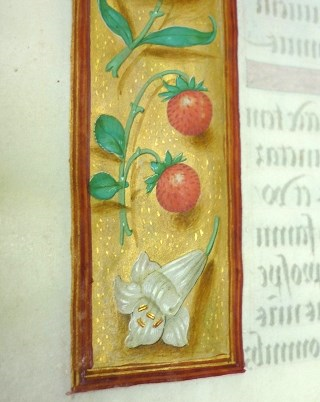 She escaped to Brussels and Amsterdam where the opulent book of hours passed into her possession. She travelled to Cologne where she spent the final years until her death in 1642. The book of hours remained there until 1832, when it was acquired by the English manuscript collector Francis Douce who in 1834 bequeathed it to the Bodleian Library in Oxford. Every miniature of the Flemish Book of Hours of Marie de Medici evokes the sheer pleasure the miniaturist must have felt as he illustrated the narrative scenes and set up the figural groupings. His style is particularly characterized by dynamic compositions and the combination of brilliant colours. 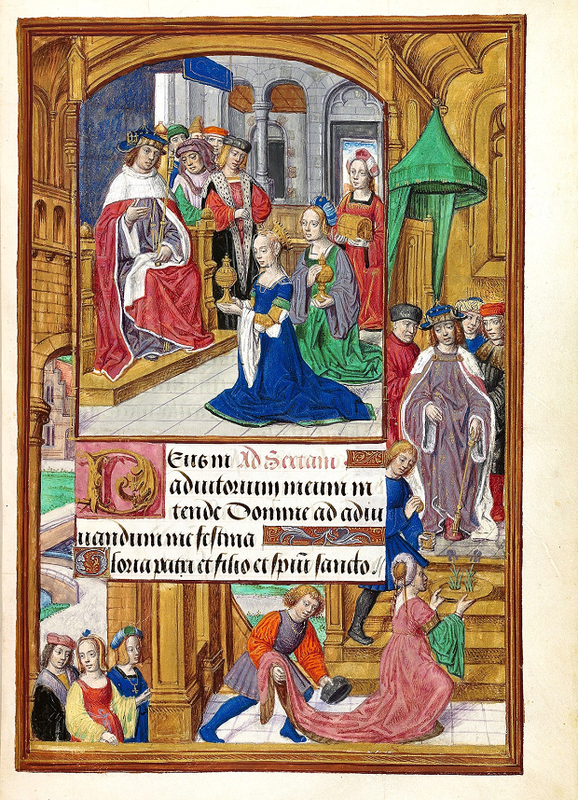 The David Scenes Master not only depicted the subject of the main miniature, but also aimed at telling as many stories as possible in one illustration. He therefore created a unified pictorial space involving the main picture and its frame, which consisted of intricate architectural borders. They feature scenes drawn from the Bible or the Golden Legend to help elaborate and comment on the narrative of the main miniature. The representation on fol. 148r is a fine example of this design. 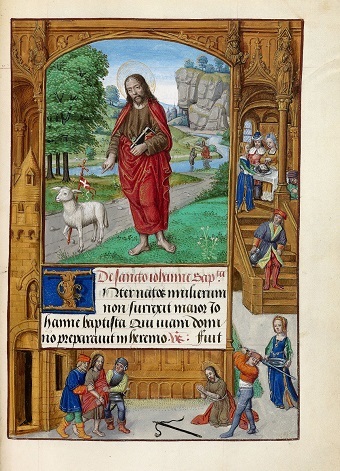 The main miniature shows John the Baptist in the desert, carrying a book. He points at the lamb which holds a flag with a cross on it. The lamb stands in a path leading to a river, where a baptism is being performed. The lamb symbolizes Christ whom John baptized in the Jordan River. Three narrative scenes in the border depict John’s martyrdom. 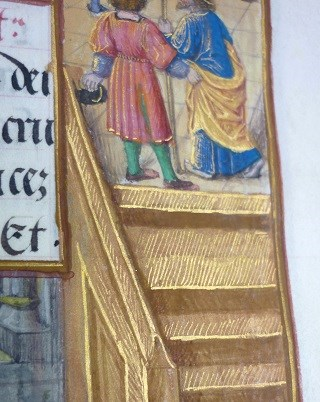 Below on the left, he is led out of the prison tower. Raising his hands in prayer, he then has to kneel down to be decapitated by the executioner. In the background Salome is waiting with a dish, on which she will carry the Baptist’s severed head to Herod and Herodias, who are seated at the banquet on the upper right. The Flemish Book of Hours of Marie de Medici is a masterpiece of the Ghent-Bruges School from the first quarter of the 16th century. The illumination in both the manuscript and the facsimile radiates a timeless beauty and creates a very special atmosphere. The miniatures, highly detailed and reminiscent of panel paintings, featuring borders shimmering with gold, fascinate the viewer by drawing him or her into the magical imagery of Flemish book illumination. The sequence selected from the Flemish Book of Hours of Marie de Medici begins with fol. 145r. The text of the prayer is illustrated by a small square miniature showing the Virgin Mary and St. John at the foot of the hill of Golgotha. A bench furnished with cushions is depicted in the architectural border below, inviting the reader and viewer to linger. The outer margins of the text pages (fols. 145v–146v, 147v, 148v and 149v) are embellished with strewn borders. The main miniatures (fols. 147r, 148r, 149r) show, in turn, the Archangel Michael battling the dragon, John the Baptist and John the Evangelist. 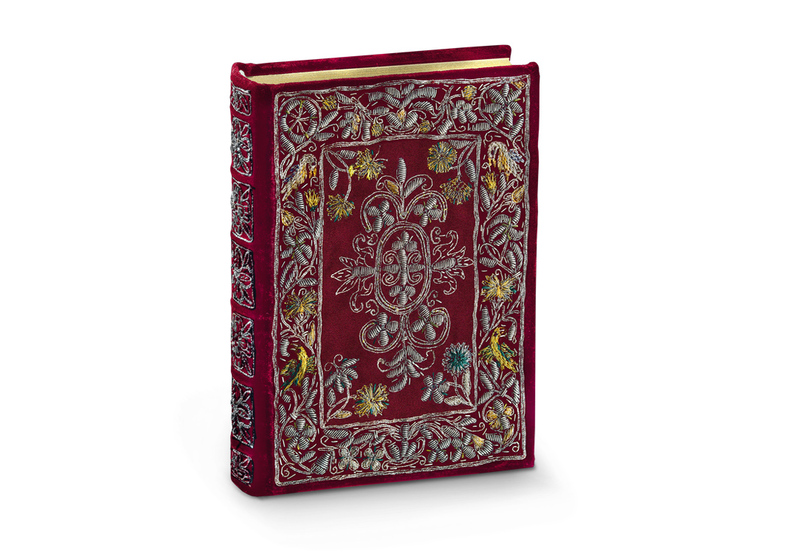 Due to the splendid velvet binding originating from before 1600 in the Netherlands, the Flemish Book of Hours of Marie de Medici is a real gem. Corresponding to the decorated borders within the manuscript, the front and the back cover, as well as the spine, are embroidered with raised floral designs in silver thread. The silver foliate sprays are inhabited by various birds embroidered in fine coloured silk thread. The facsimile binding is a faithful replica of the original. 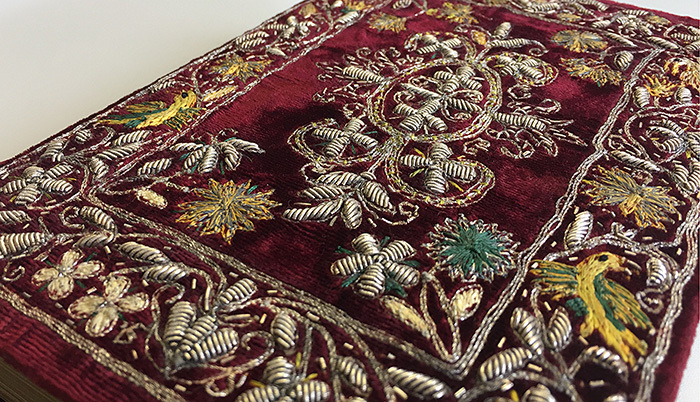 A special company in the traditional textile manufacturing city of St. Gall was commissioned to produce the elaborate silver and silk embroidery. When the prints are compared with the original, special attention is paid to the delicately shimmering powdered gold. Since it is not easily captured by the photographs taken in the library, the gold areas have to be extensively reworked by the lithographer. 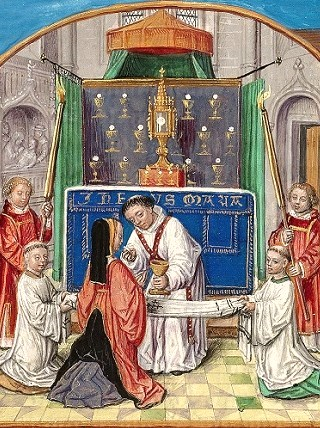 This procedure is necessary in order to ensure that even the smallest details are faithfully rendered in the facsimile. A further complication is the application of powdered gold in lines as well as in dots, as is the case in the strewn borders. The printer faces another challenge in a separate print run, when the delicate gold has to be applied exactly in the areas which correspond to the original manuscript. 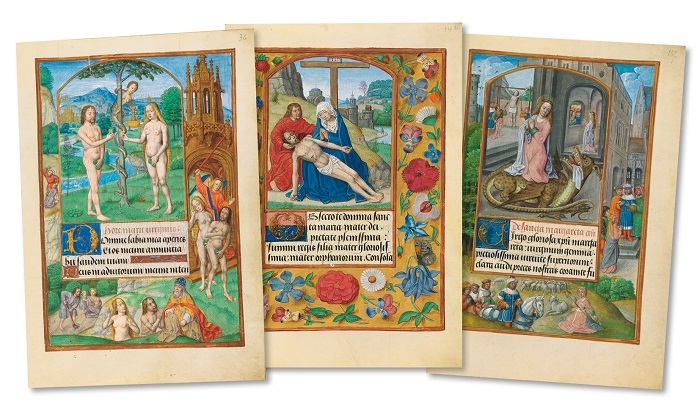 Quaternio Editions Lucerne has prepared a facsimile folder for you to appreciate the fine quality of the edition of the Flemish Book of Hours of Marie de Medici. The linen-bound folder contains three miniatures showing the following subjects: the Fall of Man and the Expulsion from Paradise, a Pietà with a strewn border, and St. Margaret as she escapes unharmed from the dragon’s belly. 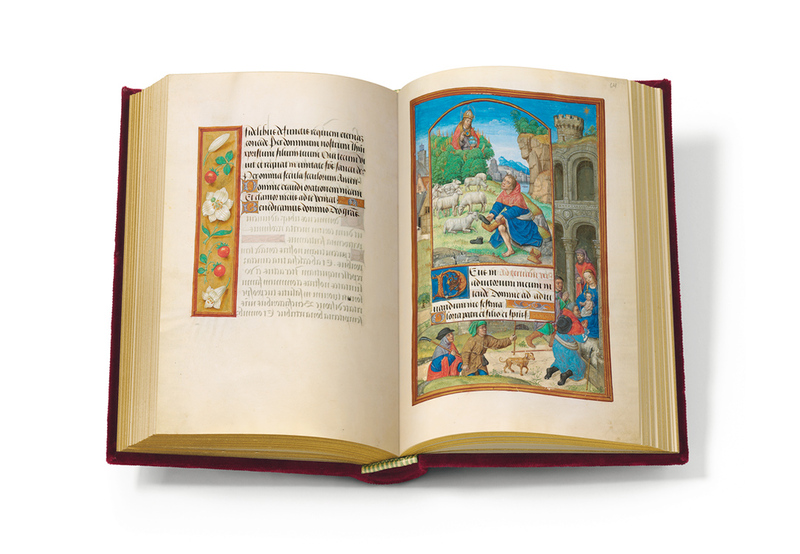 In a richly illustrated 16-page brochure, read more about the history and the illumination of this exceptionally beautiful manuscript. Discover further details of the last flowering of European book illumination when the production of illuminated books was gloriously dominated by the Ghent-Bruges School. Click here to go to the online shop (German only) where you can order the facsimile folder for the Book of Hours of Marie de Medici edition. Or send us an email to info@quaternio.ch. 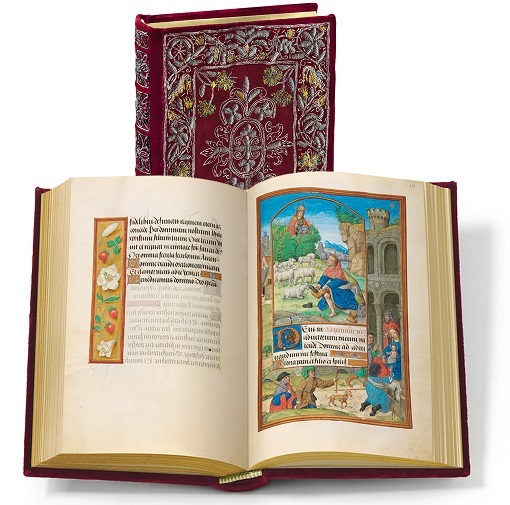 We would be glad to provide you with additional information regarding the fine art facsimile edition of the Flemish Book of Hours of Marie de Medici. Click here to order the brochure.